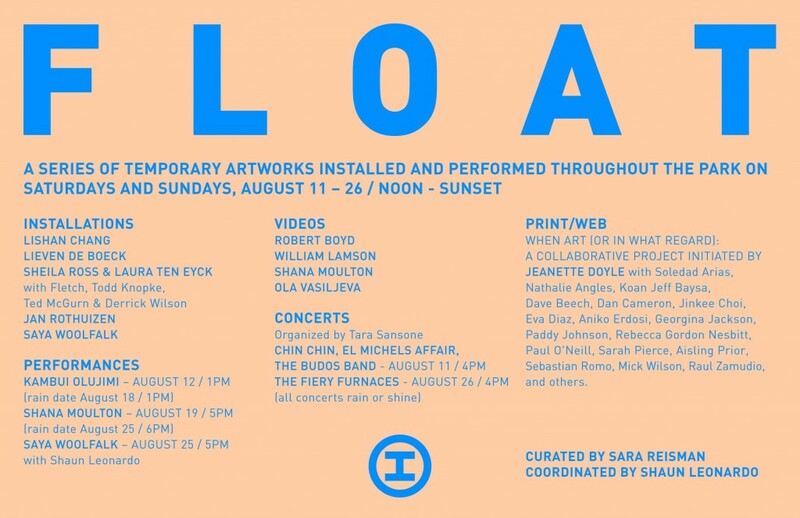 Socrates Sculpture Park is pleased to announce the 2007 edition of Float, a biennial series of time-based and ephemeral works installed and performed throughout the Park on Saturdays and Sundays in August. Launched in 2003, Float was first organized in response to Socrates Sculpture Park’s location on the East River waterfront. 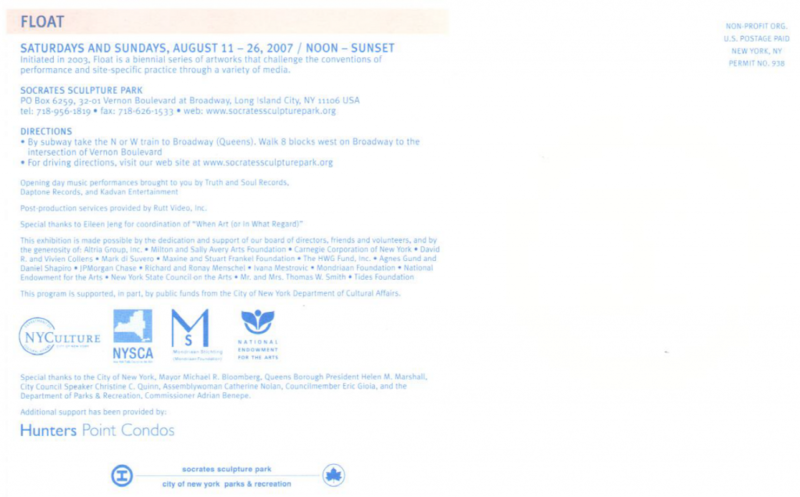 In 2005, locational and relational aesthetics were emphasized, and now, in 2007, the series takes up the theme of nostalgia for a future past, and focuses on a wider range of media to include a concert series, a discursive newsprint publication and blog, several performative installations, and a video program. For the duration of the series, videos by Robert Boyd, William Lamson, Shana Moulton, and Ola Vasiljeva will be screened continuously. Covering a range of styles, the four video artists’ works converge around their relationships to ideology, identity, and spiritual transformation. Boyd’s videos captures the frenzy of cult rituals, while Moulton’s Whispering Pines series of videos pursue self-help and actualization of the individual, culminating with an outdoor performance by the artist scheduled for August 19. Vasiljeva’s hand-made animations of floating characters like Michael Jackson singing opera formally touch on symbols associated with the occult. Lamson’s videos simply express the physical properties of weightlessness, a quality implied by spiritual and technological transformation. On view on all three weekends are installations by Lishan Chang, Lieven de Boeck, Sheila Ross and Laura Ten Eyck with Fletch, Todd Knopke, Ted McGurn, andDerrick Wilson, Jan Rothuizen, and Saya Woolfalk, whose projects collectively articulate idealism associated with utopian notions of the future, as well as loss that accompanies the passage of time. Facilitating a return to youth is Kambui Olujimi’s Skipping Stones, which begins with a contest on August 12 for participants of all ages and will culminate in the production and distribution of prizes — artworks made by Olujimi — awarded to winners. Sheila Ross and Laura Ten Eyck et al, will expand Yurt City, a project installed in the sculpture garden of Dam Stuhltrager Gallery last summer. With their colorful portable tent structures, the project recalls collective lifestyles of the 1960s and 1970s, but is adaptable to the contemporary urban landscape. Jan Rothuizen’s Missing is an installation seeking to reclaim a variety of losses: pets, personal affects, and people. Lost in time is Saya Woolfalk’s No Place, a fantasy structure built for the future from waste materials of the past. No Place will be activated with a performance by Shaun Leonardo on August 25. Echoing architecture and nature is Lishan Chang’s project LC space @ SSP. Chang’s transparent and luminescent sculpture is made of stretched plastic wrap that emphasizes the contrasts between man-made materials and the natural landscape of the Park. Produced especially for Float are two takeaway projects: a series of stickers by Lieven de Boeck that layer found graffitied surfaces into a new symbolic code; and Jeanette Doyle’s When Art (or In What Regard). Doyle’s project is a newsprint publication in which fifteen critics, curators, and artists respond to a set of questions on the status of art outlined by Doyle and Float curator, Sara Reisman. Each critic’s contribution to the newsprint edition addresses timeliness in relation to the reception of art, much like the riddle, if a tree falls in the forest and there is nobody around, does it make a sound? Additional contributions can be made by visiting whenart.typepad.com. Post production services provided by Rutt Video, Inc. Special thanks to Eileen Jeng for coordination of “When Art (or In What Regard)”. This exhibition is made possible by the dedication and support of our board of directors, friends and volunteers, and by the generosity of: Altria Group, Inc., Milton and Sally Avery Arts Foundation, Carnegie Corporation of New York, David R. and Vivien Collens, Mark di Suvero, Maxine and Stuart Frankel Foundation, The HWG Fund, Inc., Agnes Gund and Daniel Shapiro, JPMorgan Chase, Richard and Ronay Menschel, Ivana Mestrovic, Mondriaan Foundation, National Endowment for the Arts, New York State Council on the Arts, Mr. and Mrs. Thomas W. Smith, Tides Foundation. This program is supported, in part, by public funds from the City of New York Department of Cultural Affairs. Special thanks to the City of New York, Mayor Michael R. Bloomberg, Queens Borough President Helen M. Marshall, City Council Speaker Christine C. Quinn, Assemblywoan Catherine Nolan, Councilmember Eric Gioia, and the Department of Parks & Recreation, Commissioner Adrian Benepe. Additional support has been provided by: Hunters Point Condos.